Mkts rebound on value buying. Bulls have gained control over the stock markets on Thursday, the last day of August series, while pushing the benchmarking indices up 2 per cent. The investor sentiment also improved after clear hints from Fed that the rate hike plan expected to be delayed. Mumbai: Bulls have gained control over the 0s on Thursday, the last day of August series, while pushing the benchmarking indices up 2 per cent. The investor sentiment also improved after clear hints from Fed that the rate hike plan expected to be delayed. 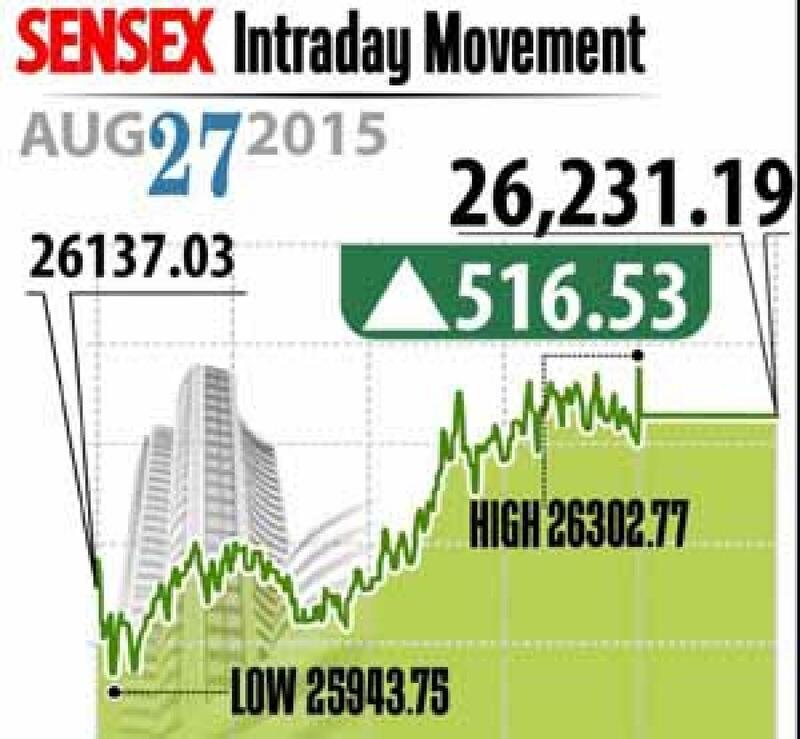 Sensex closed up by 517 points at 26,231, Nifty zoomed 159 points to 7,949. The broader markets also outperformed on par with heavyweights with midcap and smallcap up by 2.5 per cent each. Meanwhile, rupee strengthened against the dollar and is currently trading at Rs 65.98. On sectoral front, consumer durables index gained over 5 per cent followed by healthcare and oil & oil indices up by 2 per cent. Interestingly, no sector is trading in negative. The markets were driven higher with banking, healthcare, oil and metals stock, with ITC, Lupin, Sun Pharma, Axis Bank, Cipla, ONGC, Vedanta and Tata Steel up between 2.6 to 6.6 per cent. Most of heavyweights raised on value buying, like HDFC gained 8.4 per cent after declining about 19 per cent in the last one month. Similarly, Vedanta also gained over value buying at hit 6.5 per cent. Other banking stocks, BoB up 6 per cent, Kotak Bank up 3.7 per cent, Axis Bank 2.7 per cent and HDFC Bank gained 1.2 per cent. Interestingly, the analysts are still not sure whether the market bottomed, even after dipping about 1,600 points on the Sensex in the last three consecutive sessions. They say, though India's fundamentals remain strong, China and Greek crisis would play in the near term, thus volatility may still continue in the markets. The August series was the worst hit in the last two years, with Nifty declining 5.3 per cent, due to global cues more China crisis. Even Sensex lost about 5.6 per cent while Bank Nifty down 6.6 per cent. The gainers: HDFC, up 8.41 per cent at Rs 1,195.20; Vedanta, up 6.55 per cent at Rs 91.15; Tata Steel, up 4.80 per cent at Rs 225.85; Lupin, up 4.79 per cent at Rs 1,898.50; and Cipla, up 3.95 per cent at Rs 661.15. The losers: BHEL, down 3.54 per cent at Rs 231.70; Bajaj Auto, down 2.44 per cent at Rs 2,189.30; Tata Motors, down 0.62 per cent at Rs 334.70; NTPC, down 0.50 per cent at Rs 119.15; and Hero MotoCorp, down 0.47 per cent at Rs 2,380.70.